As educators, we know that asking questions - taking an inquiry stance as professionals - can lead us to deeper understanding about the craft of teaching. Sometimes the understanding comes from answers, or at least responses, that move us closer to an answer. Sometimes the greater understanding comes from questions - questions that make you realize what you are really asking. 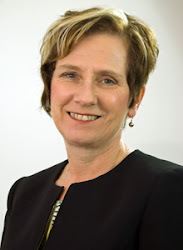 In late October, I was working with a group from Ontario that included a superintendent, curriculum consultants, a principal, teachers, and an educational assistant. 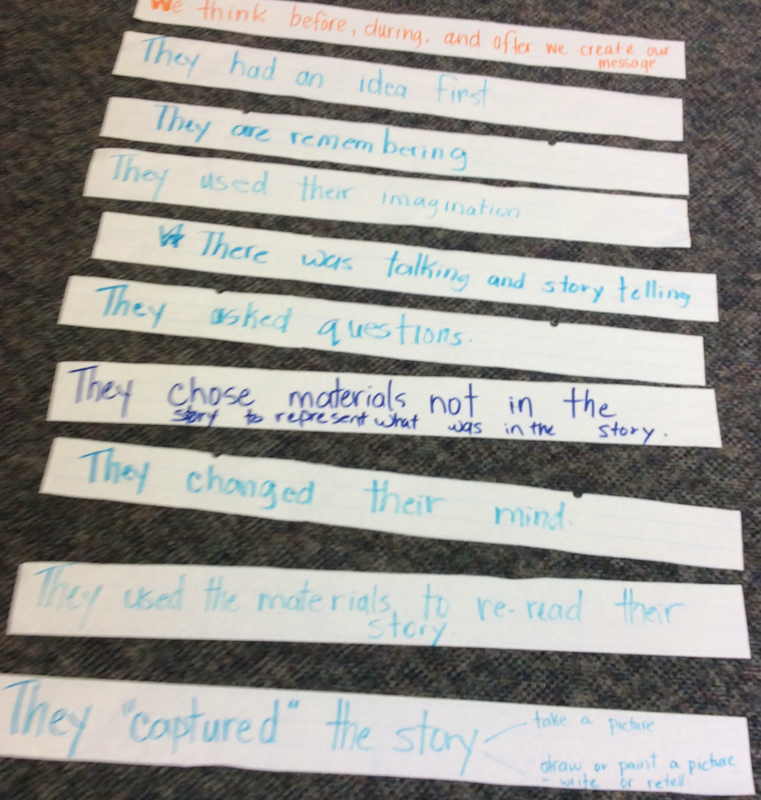 The original plan was that I help them explore ways to introduce and use their newly constructed writing continuum. On Day One, we explored that through several demonstration lessons across grade levels with time after to debrief, share observations, and ask questions. There were many questions about how this might look using an inquiry approach, and even more specifically, how it could look in full-day kindergarten with a play-based inquiry approach and Reggio Emilia influences. What does "writing" mean? Does it mean to communicate with written language only or does it mean to be a storyteller? What does writing in Kindergarten look like in a play-based inquiry approach? In what ways might telling your story with materials connect to and support telling your story with words? We decided on a plan for Day Two that we hoped would inform our thinking on these questions. 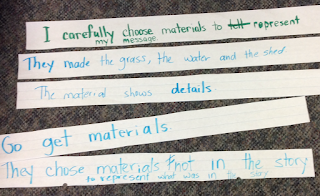 We would work together in Kindergarten to co-construct criteria based on a sample of quality. 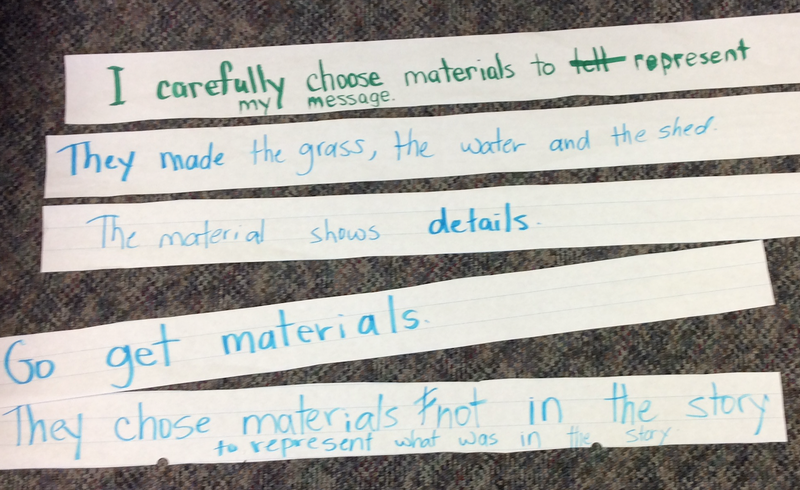 What counts in sharing your message with materials? Two of the teachers modelled what it could look like to share your thinking (your message) with materials. They began with a story they wanted to tell - a highly entertaining account of a time when they worked at a golf course and were given the task of painting a shed blue on a very windy day. Just as I had done the day before with writing, they modelled their process and shared their thinking with the students. They began by telling their story and searching for materials to represent it - thinking aloud for the students to describe their process. 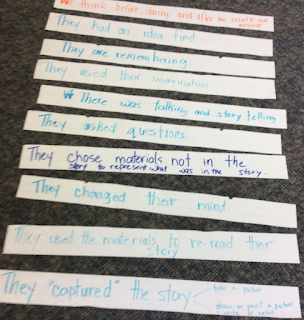 After five minutes I asked the students what they had noticed and then recorded their ideas on sentence strips. The teachers continued modelling for two more five-minute segments and I asked the students what they saw and heard the teachers do after each segment. In this way we collected the brainstorm list that is the first step in co-constructing criteria. Because we were excited by what had occurred in the Kindergarten class and wanted to analyze it together, we borrowed the sentence strips filled with what the students had noticed, and sorted them into categories. We knew that the teacher and the students would, in the fullness of time, sort it themselves and maybe not in the way we did. We needed to speed the process up to see where the sorting would take us. Day Three of our work together was not for some months and we couldn't wait. It felt like something important had happened in that classroom and we needed to look at the evidence - the recorded strips, our observations, and the conversations we had heard between students and teachers, and students and students. We carefully choose materials to represent our message. We make our message interesting. We think before, during, and after we create our message. In the photos below you will see the category names (now the criteria) in green, purple, and orange and the details (from our original brainstorm list) in blue. We could see the connections to writing so clearly. We could see the parallels between writing (one form of symbolic representation, one of the hundred languages) and using materials to represent our thinking (another form of symbolic representation, more of the one hundred languages of children). What does taking an inquiry approach really mean? What could it look like in my classroom? Where is the curriculum in all of this? How does assessment for learning fit in an inquiry-based instructional model? Is there a role for explicit teaching in an inquiry-based approach? Explicit teaching in the form of co-constructing criteria doesn't shut inquiry down or take control of the learning. Just the opposite. It puts the learners in the driver's seat. Thank you to the Kenora Catholic District School Board and St. Louis School for the conversations, observations, and products that led to this thinking.